STAR TREK MR. SPOCK FIGURE BY KNICKERBOCKER TOY CO.
Star Trek Mr. SPOCK doll. This figure was made by " KNICKERBOCKER TOY CO." in 1979. 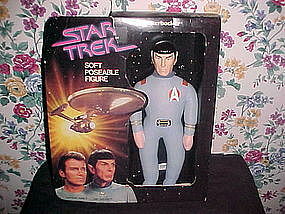 The Mr. Spock doll is in Mint condition and measures about 12 1/2". It comes in its original box. This box has couple of creases but it is in very good displayable condition. 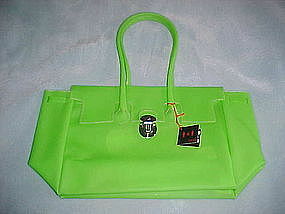 A great Star Trek item!!! Vintage Star Trek Captain Kirk doll. This figure was made by " KNICKERBOCKER TOY CO." in 1979. 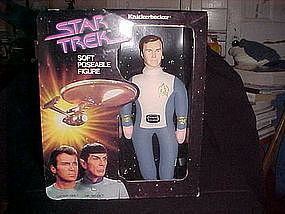 Captain Kirk is in Mint Condition and it is in Original box. The box has a few creases but remains in Very good presentable condition!! Captain Kirk measures about 12 1/2" in height. 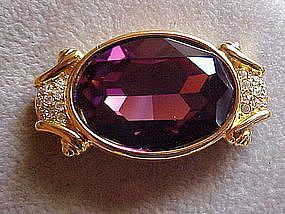 Lovely gold plated rhinestone and Amethyst crystal pin. This wonderful pin was created by SWAROVSKI and has the famous "Swan" signature. It features a very large Amethyst crystal flanked by scrolls of Swarovski diamond crystal rhinestones. 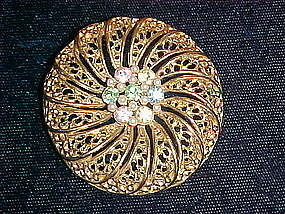 This pin is in very fine condition and measures 1 7/8" wide X 1" high. 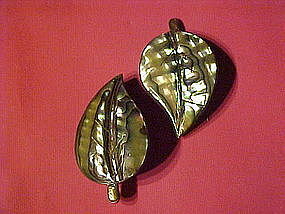 Wonderful hand crafted Taxco leaf pins. These are sterling silver and abalone. 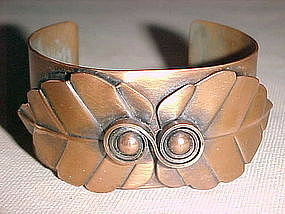 They are signed " TAXCO SJB 925, and each has the stylized eagle with #3 for Taxco." They each measure 2 1/4" long and each is 1 3/4" wide. 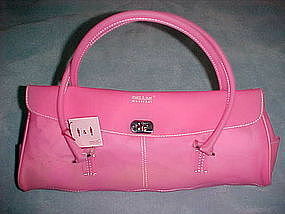 They are in fine condition with the exemption that they both are missing the clasp locks, but the pins close securely. They would look stunning when worn as a pair. Wonderful leaf pin signed " CORO ". This gold toned pin has detailed textured surface with seven faux pearls flanked by two tiny aurora borealis rhinestones. 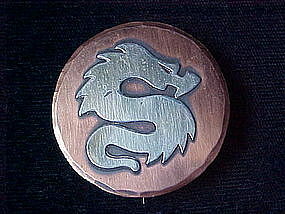 This pin is well weighted and measures 3 6/8" long. 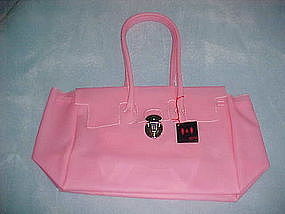 It would look lovely on that special night out!!! 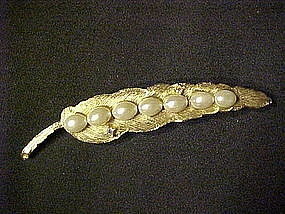 Stunning gold tone rhinestone and faux pearl pendant necklace by CHRISTIAN DIOR. 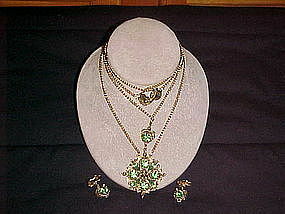 This Super necklace is in EXCELLENT CONDITION and Investment quality!!! 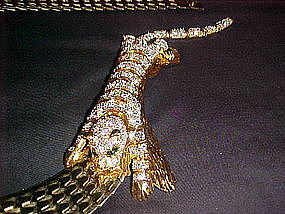 A must have for the upscale Collector!!! 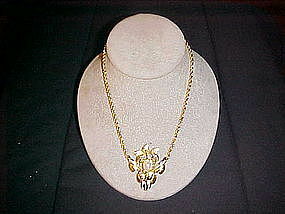 This necklace measures 16 1/2" in length. 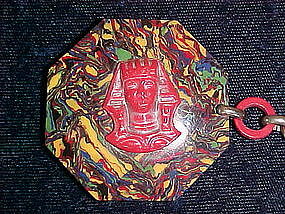 The pendant is 1 7/8" long. 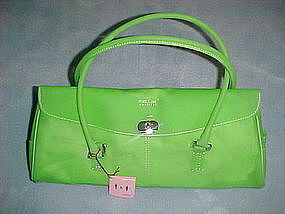 It has two signed clasps and has the famous double CD clasp bar. This is truly a show stopper!!! Pretty hand painted enamel on copper earrings. This 1950's era earrings feature a moderne hand painted design. Each measures 1 3/8" long and are in very good condition with no damage to the enamel work. One is signed " ML ." The copper screw on hardware are of different styles which might be that one was replaced. This does not take away the beauty of the earrings. 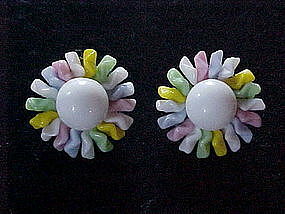 Pretty 1950's era clip on earrings. Each earring features a flower composed of a white glass ball framed by glass petals of multi colors. 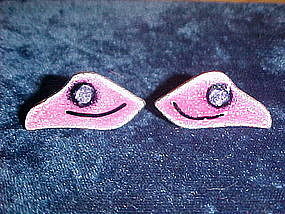 This clip on earrings are in very fine condition and each is mark in back " Made in Germany West." They each measure 1 1/8" in diameter. These happy bright color earrings would be great to wear at a beach or pool party.